The Game of Thrones season five finale was watched by almost 1.7 million people on Sky Atlantic, according to overnight figures. The episode, in which a number of main characters met their demise, attracted 1.4 million at 21:00 BST on Monday - 6.9% of the total TV audience. Another 275,000 tuned in for an earlier 02:00 BST showing, which went out at the same time as the US broadcast. Sky Atlantic said a similar number watched that screening on demand. The 1.4 million figure is just shy of the series highest-rated episode - the premiere of season five was watched by 1.6 million viewers in April. Torrent Freak, an online publication which collates filesharing news, said the episode "set a new piracy record", with 1.5 million downloads in eight hours. It said that number would "swell to over 10 million during the days to come" and that it also broke the all-time record for the number of people sharing a single file at the same time. The final episode shocked fans after main character Jon Snow was murdered by men of the Night's Watch. British actor Kit Harington dashed hopes he would be returning to the fantasy drama next year, confirming to Entertainment Weekly: "I'm dead. I'm not coming back next season." 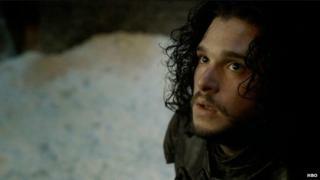 Sky Atlantic retained 412,000 viewers for the fan show Thronecast broadcast at 22:00 BST.